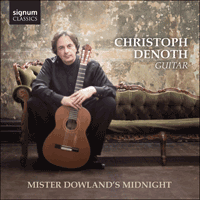 Swiss guitarist Christoph Denoth explores the enchanting lute music of John Dowland, in a collection of his own arrangements made from Dowland’s original handwritten scores. John Dowland (1563-1626) remains a shadowy figure, despite being one of the greatest song writers, lute players, and composers of instrumental music of the late Elizabethan and early Stuart eras. Our concept of his personality today is largely the result of his own self-fashioned image. Dowland’s songs certainly show a predilection for melancholic poetry; he adopted the ‘Lachrimae’ pavan as his personal emblem (signing himself ‘Jo: Dolandi de Lachrimae’ [‘of the tears’]), and his letters and the prefaces to his publications contain many references to the slights he felt, he had received from his contemporaries. All this paints a portrait of a rather unstable and perhaps ‘romantic’ character. But that is only part of Dowland’s story, as his surviving music shows. It is true that his career suggests that he was, unusually for an Elizabethan musician, more attractive to continental employers than at home. He travelled widely abroad and had to wait until 1612 to obtain the post he had long coveted as one of the royal ‘lewters’ in the English court musical establishment. Before then, however, he had enjoyed something of a stellar career, with well-paid appointments at courts in Germany and Denmark. Dowland also made sure that his music was available in England through the relatively innovative medium of print. He clearly had friends in high places: many of Dowland’s songs set texts by Elizabethan noble courtiers, some of whom acted as his patrons, and recent research indicates that once he had returned to London around 1606 he was much in demand, playing for masques and teaching the lute to members of the elite families of the city. Of his earlier career, we can catch only tantalising glimpses. There is no documentary evidence of Dowland’s place or date of birth, though in his last publication, A Pilgrimes Solace of 1612, he described himself as ‘being now entered into the fiftieth yeare of mine age’. We know nothing of his family background, upbringing, or musical training. But in 1580, he went as a teenaged servant to Sir Henry Cobham, the Ambassador to the French court in Paris. We next hear of Dowland in 1588, the year of the Spanish Armada, when he received the degree of Mus. Bac. from Oxford. In the early 1590s, his music was performed at court, but in 1594 he failed to secure the place in the Queen’s music left unfilled on the death of John Johnson. He decided instead to travel to Germany and Italy, seeking employment abroad but also aiming to learn the latest musical developments from the great madrigalist Luca Marenzio in Rome. Dowland visited Venice and Ferrara, both centres of the musical avant-garde in the 1590s, and performed at the ducal court in Florence. But he never got as far as Rome, since, as we learn from a long and at times rambling letter written to Sir Robert Cecil in 1595, Dowland found himself in the company of a group of potentially treacherous English Catholics and was afraid he would be tainted by association. In 1596, the first of his lute solos were published in William Barley’s A new Booke of Tabliture. Dowland complained that this was done without his knowledge, and that the printed versions were ‘falce and vnperfect’, but Barley’s publication did bring to a wider audience Dowland’s signature pavan ‘Lachrimae’ [track 7], later arranged as the song ‘Flow my teares’, the coquettish ‘Mistress Winter’s Jump’ [track 1] and his music for the ballad ‘Fortune [my foe]’ [track 14], a tune associated with public hangings. The next significant stage in Dowland’s career took him in 1598 to a well-paid position at the court of King Christian IV of Denmark, an enthusiastic and lavish patron of music who was equally fond of hard drink. Dowland’s galliard named for the King [track 17] shares ideas with a number of other 16th-century ‘battle’ pieces, with its limited harmonic language and corruscating embellishments. In 1603, Queen Elizabeth was succeeded by James I, whose wife Anne was King Christian’s sister. Dowland’s hopes of a court appointment in London must have been raised by this turn of events, but despite shuttling back and forth from Denmark to England, publishing a further songbook and dedicating a revolutionary set of five-part consort dances with lute to Queen Anne (Dowland’s preface states that he ‘had accesse to your Highnesse at Winchester’ before publication), the English court appointment remained elusive and he was passed over for a relative nonentity when the next vacancy occurred in 1610. The latter part of Dowland’s life was spent in performing and teaching, contributing items to anthologies of psalms and devotional partsongs, and translating Micrologos, a treatise by the early 16th-century German Andreas Ornithoparcus. In 1610, Dowland’s son Robert, another lutenist, published his Varietie of Lute-Lessons, an anthology of works by composers from all over Europe. This print included his father’s belated tribute to the former monarch, ‘Queen Elizabeth, Her Galliard’ [track 5], who is said to have regularly danced several galliards before breakfast and who is herself portrayed playing the lute in a miniature by Nicholas Hilliard. Robert Dowland’s collection also contained the galliard named for ‘The Right Honourable The Lady Rich’ [track 2], a piece of tender simplicity, and the rather more robustly four-square ‘Sir John Smith, His Almain’ [track 20]. Although Dowland published no more after 1612, his last years were not a period of retirement. He is documented taking part in performances at the Inns of Court and at the London house of the Earl of Devonshire. His handwriting also appears in a lute manuscript owned by his student Margaret Board, which has been dated to the 1620s. This is the unique source of the sonorous ‘Preludium’ [track 6] and the strangely sparse ‘Mister Dowland’s Midnight’ [track 25]. Dowland’s last documented appearance was in the Consorte that played at the funeral solemnities of James I in 1625; his own death followed within the year. Other pieces in Dowland’s output for lute touch quite different emotional states, from the deep reflection of ‘Captain Digorie Piper’s Galliard’ [track 16], named for a notorious pirate, to the lighthearted tunefulness of the many miniature pieces such as ‘Mistress Nichols’ Almain’ [track 22] or ‘My Lady Hunsdon’s Puffe’ [track 15]. Many of these pieces are in the principal dance forms of his day, though by the time Dowland has added his constantly inventive decorations, this music has been transformed into something purely artistic, raised above the needs of the functional dance. Other pieces, such as ‘Orlando Sleepeth’ [track 18] and ‘Tarleton’s Riserrectione’ [track 12], may be associated with music for dramatic presentations (Richard Tarleton was a famous Elizabethan actor), while a further number, including the galliard ‘Awake Sweet Love’ [track 24] and ‘The Frog Galliard’ [track 8] doubled up as lute pieces and songs. Several of these lute solos survive in different sources, each with their own variants, and contemporary players were expected to be able to add their own embellishments and ‘graces’ to the written music. However, as Thomas Morley says in 1597, it was the fantasia that was ‘the most principal and chiefest kind of musicke which is made without a dittie’ and, he continues, ‘in this may more art be showne than in any other musicke, because the composer is tide to nothing but that he may adde, deminish and alter at his pleasure’. Dowland’s ‘A Fancy’ [track 4] lives up to this description supremely well, showing both contrapuntal artifice, and a wide palette of instrumental techniques, providing the player with scope for virtuosity of both fingers and imagination in its performance. Despite his frequent protestations to the contrary, Dowland was highly appreciated by his English contemporaries. His songs were cited by Shakespeare and other playwrights, while Henry Peacham in The Compleat Gentleman (London, 1622) listed him as ‘inferior to none in the world’ and ‘one of our greatest Masters of Musicke for composing’. Dowland’s lute music continued to be copied after his death in 1626, and continues to delight us still with its profound diversity. John Dowland (1563-1626) reste un personnage énigmatique, bien qu’étant le plus grand des auteurs-compositeurs, des luthistes et des compositeurs de musique instrumentale de la fin de la période élisabéthaine et du début de la période des Stuarts. Notre perception actuelle de sa personnalité provient principalement de l’image qu’il s’est forgé lui-même. Les chants de Dowland illustrent une prédilection pour la poésie mélancolique; il adopte la pavane «Lachrimae» comme emblème personnel (s’y identifiant lui-même en signant «Jo: Dolandi de Lachrimae [‘des larmes’])»; ses lettres et les préfaces de ses publications contiennent de nombreuses références aux affronts de ses contemporains qui le blessent. Ceci brosse le portrait d’un personnage plutôt instable et peut-être «romantique». Mais ceci n’est qu’une partie de l’histoire de Dowland, ainsi que la musique qu’il nous a léguée le prouve. Les dédales de sa carrière indiquent qu’il était moins convoité dans son pays qu’à l’étranger, ce qui est inhabituel pour un musicien de la période élisabéthaine. Il a beaucoup voyagé à l’étranger et doit attendre 1612 pour obtenir le poste longtemps brigué de luthiste royal dans les milieux musicaux de la cour anglaise. Auparavant, il a cependant mené une carrière remarquable et obtenu des postes bien rémunérés auprès des cours d’Allemagne et du Danemark. Dowland fait aussi en sorte que sa musique soit accessible en Angleterre, en utilisant une méthode relativement novatrice à l’époque, l’imprimerie. Il a sans aucun doute des amis haut placés: un grand nombre de ses textes sont imprimés par des nobles courtisans, certains lui servant de mécènes; de récentes recherches indiquent qu’une fois rentré à Londres vers 1606, il est très sollicité, joue dans les «masques» et enseigne le luth aux élites de la ville et aux membres de leur famille. Les débuts de sa carrière n’offrent qu’un petit nombre d’informations passionnantes. Il n’existe aucune évidence documentée du lieu ou de sa date de naissance bien que dans sa dernière publication de 1612, A Pilgrimes Solace, il se décrive comme «entrant dans la cinquante-cinquième année de ma vie». Nous ne savons rien de ses origines familiales, ni de son éducation ou de sa formation musicale. Cependant, encore adolescent en 1580, il entre au service de Sir Henry Cobham, ambassadeur auprès de la cour de France à Paris. Il apparait à nouveau en 1588, à l’arrivée de l’Armada espagnole, lorsqu’il obtient le diplôme de Bachelor of Music à Oxford. Au début des années 1590, ses oeuvres sont représentées à la cour mais, en 1594, à la mort de John Johnson, sa candidature comme luthiste de la reine est refusée et le poste ne sera pas pourvu. Il décide alors de voyager en Allemagne et en Italie, pour chercher un emploi à l’étranger mais également pour essayer de s’initier aux derniers développements musicaux auprès du grand madrigaliste Luca Marenzio, à Rome. Dowland est allé à Venise et Ferrare, deux centres de musique avant-gardistes réputés dans les années 1590, et s’est produit à la cour ducale de Florence. Il n’ira pas jusqu’à Rome car, d’après une longue lettre un peu décousue qu’il a écrite à Sir Robert Cecil en 1595, il se trouve mêlé à un groupe de catholiques anglais, potentiellement impliqués dans des actes de trahison, auprès desquels il craint d’être entaché par association. En 1596, le premier de ses solos pour luth est publié dans A new Booke of Tabliture de William Barley. Dowland se plaint de ne pas avoir été consulté et que les versions publiées sont «fausses et imparfaites», mais la publication de Barley a largement contribué à faire connaître Lachrimae [piste 7], pavane réarrangée ensuite pour devenir la chanson intitulée Flow my teares, ainsi que Mistress Winter’s Jump [piste 1], chanson tout en coquetterie, ainsi que sa musique pour la ballade Fortune [my foe] [piste 14], une mélodie qui est associée aux pendaisons publiques. La prochaine étape importante de la carrière de Dowland survient en 1598, alors qu’il obtient un poste bien rémunéré à la cour du roi Christian IV de Danemark, mécène enthousiaste et généreux dans le domaine de la musique et tout aussi amateur d’alcool. Dans sa Gaillarde au nom du roi [piste 17], Dowland partage des inflexions avec certaines autres musiques de bataille du XVIe siècle, au langage harmonique limité et aux brillants ornements. En 1603, Jacques 1er succède à la reine Elisabeth, sa femme Anne étant la soeur du roi Christian de Danemark. Ces évènements ont certainement ravivé l’espoir de Dowland d’obtenir un poste à la cour, mais ses espoirs restent vains, malgré ses nombreux déplacements entre le Danemark et l’Angleterre, la publication d’un autre livre de chants, ainsi qu’une série révolutionnaire d’ensembles de danses en cinq parties avec luth, dédicacée à la reine Anne (la préface de Dowland indique qu’il a eu «accès à votre Altesse à Winchester, avant la publication»). Il est cependant resté relativement méconnu jusqu’à la prochaine vacance de poste en 1610. Les dernières années de la vie de Dowland sont consacrées à la représentation et à l’enseignement, contribuant également à des anthologies de psaumes et de lieder sacrés et à la traduction de Micrologos, un traité du début du XVIe siècle de l’allemand Andreas Ornithoparcus. En 1610, le fils de Dowland, Robert, luthiste lui aussi, publie Variete of Lute-Lessons, une anthologie des oeuvres de compositeurs européens. Ce manuscrit contient l’hommage posthume de son père à l’ancienne reine, Queen Elizabeth, Her Galliard [piste 5], dont on dit qu’elle dansait régulièrement plusieurs gaillardes avant le petit-déjeuner et qui est représentée jouant du luth sur une peinture miniature de Nicholas Hilliard. La collection de Robert Dowland contient également une gaillarde intitulée The Right Honourable The Lady Rich [piste 2], une pièce de tendre simplicité, ainsi que Sir John Smith, His Almain [piste 20], plus fortement engagée. Dowland arrête de publier après 1612, mais ses dernières années ne sont pas inactives. Des documents prouvent sa participation à des représentations dans des Inns of Court, ainsi qu’au domicile londonien du Comte de Devonshire. En outre, son écriture apparait dans un manuscrit pour luth des années 1620, appartenant à l’une de ses étudiantes, Margaret Board. Ceci représente l’unique source de l’éclatant Preludium [piste 6] et de Mister Dowland’s Midnight [piste 25], un morceau étonnamment rare. Sa dernière présence documentée date de 1625, au sein de l’ensemble musical qui joua lors des funérailles de Jacques 1er, l’année précédent sa propre mort. D’autres pièces dans l’oeuvre pour luth de Dowland, atteignent des états émotionnels bien différents, comme la réflexion profonde dans Captain Digorie Piper’s Galliard [piste 16], intitulée d’après un pirate notoire, ou comme le caractère léger et mélodieux de nombreuses pièces miniatures telles que Mistress Nichols’ Almain [piste 22] ou My Lady Hunsdon’s Puffe [piste 15]. Plusieurs de ces pièces s’inscrivent dans les formes majeures des danses de l’époque, bien qu’après que Dowland y ait ajouté ses ornements constamment inventifs, cette musique est transformée et devient purement artistique, bien au-delà des besoins fonctionnels de la danse. D’autres pièces, telles que Orlando Sleepeth [piste 18] et Tarleton’s Riserrectione [piste 12] peuvent avoir des traits de caractère communs avec la musique pour représentations dramatiques (Richard Tarleton était un célèbre acteur élisabéthain), alors que certaines autres, y compris la gaillarde Awake Sweet Love [piste 24] et The Frog Galliard [piste 8] sont à la fois des pièces pour luth et vocales. Plusieurs de ces solos pour luth ont survécu au sein de différents univers, chacun avec ses propres variantes, mais il fallait que les musiciens contemporains puissent ajouter leurs propres grâces et ornements à l’écriture de la musique. Cependant, comme l’exprime Thomas Morley en 1597, c’était la fantaisie qui était «le type de musique le plus important, genre suprême, sans aucune ‘chansonnette’», et il continue, «l’art est ici peut-être plus évident que dans toute autre forme de musique car le compositeur n’a pas de contraintes et il peut ajouter, diminuer et altérer selon son bon plaisir». A Fancy [piste 4], illustre parfaitement cette description au travers de l’artifice contrapuntique et de la large palette de techniques instrumentales qui offrent au musicien une étendue de virtuosité aux deux doigts et laisse la place à l’imagination dans son interprétation. En dépit de ses fréquentes affirmations contraires, Dowland était en fait très apprécié de ses contemporains anglais. Ses chants ont été cités par Shakespeare et autres dramaturges, alors qu’Henry Peacham le cite comme étant «inférieur à aucun autre au monde» et «l’un de nos plus grands maîtres de musique en tant que compositeur», dans The Compleat Gentleman (Londres, 1622). La musique pour luth de Dowland a continué à être reproduite après sa mort en 1626 et elle continue de nous ravir par sa diversité profonde. John Dowland (1563-1626) ist gewissermassen ein Unbekannter, obwohl er als einer der grossartigsten Liederkomponisten, Lautenspieler und Komponisten instrumentaler Musik des ausgehenden elisabethanischen Zeitalters und der beginnenden Stuart-Ära gilt. Unsere Auffassung seiner Persönlichkeit ist heute weitgehend das Ergebnis seines Selbstbildes. Dowlands Lieder zeigen eine deutliche Vorliebe für melancholische Poesie; er nahm die Pavane Lachrimae als sein persönliches Emblem (und unterzeichnete jeweils mit „Jo: Dolandi de Lachrimae [,der Tränen’]”), und seine Briefe und die Einleitungen zu seinen Publikationen enthalten viele Verweise auf angebliche Kränkungen durch seine Zeitgenossen. All dies zeichnet das Porträt eines ziemlich instabilen und etwas „romantischen” Charakter. Doch das ist bloss ein Teil von Dowlands Geschichte, wie seine heute noch existierende Musik zeigt. Gewiss, seine Karriere legt nahe, dass er—und dies ist recht ungewöhnlich für einen Musiker des elisabethanischen Zeitalters—für Auftraggeber auf dem Kontinent attraktiver war als für jene aus seiner Heimat. Er reiste viel im Ausland und musste bis 1612 warten, um den lange ersehnten Posten eines königlichen „lewters” oder Lautenspielers am englischen Hof zu erhalten. Bereits vorher hatte er allerdings mit gut bezahlten Berufungen an den deutschen und dänischen Hof eine ziemlich steile Karriere gemacht. Dowland sorgte auch dafür, dass seine Musik in England durch das damals innovative Medium des Drucks Verbreitung fand. Ganz offensichtlich hatte er Freunde in hohen Positionen: Viele von Dowlands Liedern entstanden zu Texten adliger Höflinge am elisabethanischen Hof, darunter einige seiner Mäzene, und die jüngste Forschung zeigt, dass er—als er um 1606 nach London zurückkehrte—sehr gefragt war, an Maskenspielen auftrat und den Mitgliedern der städtischen Oberschicht das Lautenspiel beibrachte. Vom Anfang seiner Karriere gibt es nur ein paar flüchtige Eindrücke. Es gibt keinerlei Unterlagen über Dowlands Geburtsort und -datum, wenn er sich auch in seiner letzten Veröffentlichung, A Pilgrimes Solace, von 1612 als „nunmehr anfangs des fünfzigsten Lebensjahres” beschreibt. Wir wissen auch nichts über seine Familie, seine Erziehung oder seine Ausbildung als Musiker. 1580 ging er jedoch als jugendlicher Diener mit Sir Henry Cobham, dem Botschafter am französischen Hof, nach Paris. Das nächste Mal hören wir 1588 etwas von ihm, dem Jahr der spanischen Armada, als ihm die Universität Oxford den Grad eine Musicae Baccalaureus verleiht. Anfangs der 1590er Jahre wurde seine Musik am Hofe aufgeführt; dennoch gelang es ihm 1594 nicht, sich nach dem Tod von John Johnson einen Platz unter den königlichen Musikern zu sichern. Er entschied sich statt dessen, nach Deutschland und Italien zu reisen und im Ausland eine Beschäftigung zu suchen und beim grossen Madrigalisten Luca Marenzio in Rom die neuesten Entwicklungen der Musik zu lernen. Dowland besuchte nun Venedig und Ferrara, beides in den 1590er Jahren Zentren der musikalischen Avantgarde, und trat am herzoglichen Hof von Florenz auf. Er kam jedoch nie bis Rom, da er sich—wie wir einem langen und manchmal weitschweifigen Brief an Sir Robert Cecil von 1595 entnehmen können—in der Gesellschaft einer Gruppe potentieller Verräter und englischer Katholiken befand und befürchtete, der Umgang mit ihnen würde sich als Makel erweisen. 1596 wurde das erste seiner Stücke für Laute solo in William Barleys A new Booke of Tabliture veröffentlicht. Dowland beschwerte sich, dass dies ohne sein Wissen geschehen sei und dass die gedruckten Versionen„falce and vnperfect” seien. Barleys Veröffentlichung brachte allerdings Dowlands Lieblingspavane Lachrimae [Track 7], die später als das Lied Flow my teares arrangiert wurde, ebenso wie das kokette Mistress Winter’s Jump [Track 1] und die Musik zur Ballade Fortune [my foe] [Track 14], eine Melodie, die im Zusammenhang mit öffentlichen Hinrichtungen steht, zur Kenntnis eines breiteren Publikums. Die nächste wichtige Etappe in Dowlands Karriere führte ihn 1598 zu einer gut bezahlten Position am Hof von König Christian IV. von Dänemark, einem begeisterten und grosszügigen Musikmäzen, der aber genauso stark harten Getränken zugetan war. Dowlands nach dem König genannte Galliarde [Track 17] enthält dieselben Ideen wie eine Anzahl anderer „Schlachtlieder” aus dem 16. Jh., mit einer begrenzten harmonischen Sprache und Funken sprühenden Verzierungen. 1603 wurde Queen Elisabeths I. königlicher Nachfolger am Hof James I., dessen Gattin Anne König Christians Schwester war. Dowland hoffte wohl aufgrund dieser Geschehnisse auf eine Stellung am Londoner Hof, aber obwohl er zwischen Dänemark und England hin und her pendelte, eine weitere Liedersammlung veröffentlichte und einen revolutionäres Satz von fünfteiligen sogenannten „consort dances” für Laute Königin Anne widmete (Dowlands Vorwort hält fest, dass er vor der Veröffentlichung „Zugang zu Ihro Hoheit in Winchester hatte”), entglitt ihm die Berufung an den englischen Hof und er wurde zugunsten eines relative Unbekannten übergangen, als 1610 die nächste Stelle frei wurde. Dowland bestritt den letzten Teil seines Lebens mit Konzerten und Unterricht und trug Stücke zu Psalmenanthologien und frommen A-Capella Liedern bei und übersetzte Micrologos, eine Abhandlung über den im frühen sechzehnten Jahrhundert lebenden Deutschen Andreas Ornithoparcus. 1610 veröffentlichte Dowlands Sohn Robert, ebenfalls ein Lautenist, seine Varietie of Lute-Lessons, eine Anthologie von Werken von Komponisten aus ganz Europa. Dieser Druck enthielt auch den verspäteten Tribut seines Vaters an die ehemalige Monarchin, Queen Elizabeth, Her Galliard [Track 5], die noch vor dem Frühstück regelmässig mehrere Galliarden getanzt haben soll und die in einer Miniatur von Nicholas Hilliard selbst als Lautenspielerin porträtiert wird. Robert Dowlands Sammlung enthielt auch eine Galliarde mit dem Titel The Right Honourable The Lady Rich [Track 2], ein Stück von zärtlicher Einfachheit, und die etwas strenger durchgehend 4-taktige variationsreiche Sir John Smith, His Almain [Track 20]. Und obwohl Dowland nach 1612 nichts mehr veröffentlichte, waren seine letzten Jahre dennoch nicht von einem Rückzug aus dem aktiven Leben geprägt. Man weiss, dass er an den Inns of Court spielte und im Londoner Anwesen des Earl of Devonshire. Seine Handschrift erscheint auch auf einem Lautenmanuskript, das seiner Studentin Margaret Board gehörte und auf die späten 1620er Jahre datiert wurde. Dies ist die einzige Quelle des klangvollen Preludium [Track 6] und des seltsam spärlichen Mister Dowland’s Midnight [Track 25]. Dowlands letzter nachweislicher Auftritt war mit dem Consort, den Instrumentalisten, die zum Begräbnis von James I. 1625 aufspielten; sein eigener Tod folgte im selben Jahr. Andere Stücke Dowlands für Laute berühren ganz andere emotionale Zustände, von der tiefgründigen, nach einem berüchtigten Piraten benannten Captain Digorie Piper’s Galliard [Track 16], zum fröhlich-melodischen Ansatz vieler Miniaturstücke wie Mistress Nichols’ Almain [Track 22] oder My Lady Hunsdon’s Puffe [Track 15]. Viele dieser Stücke wurden in den wichtigsten Tanzformen jener Zeit geschrieben, obwohl auch diese Musik, nachdem Dowland seine constant erfinderischen Verzierungen hinzugefügt hat, in reine Kunst verwandelt wurde, die über die Ansprüche eines reinen Tanzes hinausreicht. Andere Stücke wie Orlando Sleepeth [Track 18] und Tarleton’s Riserrectione [Track 12] kann mit Musik für dramatische Darstellungen in Verbindung gebracht werden (Richard Tarleton war ein berühmter elisabethanischer Schauspieler), während weitere wie die Galliarde Awake Sweet Love [Track 24] und The Frog Galliard [Track 8] auch als Lautenstücke und Lieder dienten. Mehrere dieser Lautensolos überleben in verschiedenen Quellen in jeweils eigenen Varianten. Von zeitgenössischen Musikern erwartete man, dass sie den schriftlich festgehaltenen Stücken ihre eigenen Verzierungen und „graces” (elegante Verzierungsformen) hinzufügten. Doch wie Thomas Morley 1597 festhielt, war die Fantasie „die wichtigste und hauptsächlichste Musikart, die ohne ein Liedchen gemacht wurde” und dass „so mehr Kunst als in irgendeiner anderen Musik gezeigt werden könne, weil der Musiker hier zu nichts verpflichtet sei, das er nicht nach seinem Belieben ergänzen, vermindern, oder verändern könne”. Dowlands A Fancy [Track 4] zeigt dies ganz souverän durch kontrapunktische Kunstgriffe und eine breite Palette an Techniken, die dem Spieler beim Auftritt Raum für Virtuosität sowohl der Finger wie der Phantasie bietet. Trotz häufiger gegenteiliger Beteuerungen wurde Dowland von seinen englischen Zeitgenossen sehr geschätzt. Seine Lieder wurden von Shakespeare und anderen Theaterschriftstellern zitiert und Henry Peacham erwähnt ihn in seinem The Compleat Gentleman (London, 1622) als „weltweit keinem unterlegen” und „einen unserer grössten Meister der Musik und Komposition” auf. Dowlands Lautenmusik wurde auch nach seinem Tod 1626 fleissig kopiert und begeistert uns bis zum heutigen Tag durch ihre profunde Vielseitigkeit. John Dowland, the English/Irish composer, has played a major role in my life as a musician and guitarist. He already inspired me at an early age, when I still lived in Switzerland and was far away from England and any of its great music from Dowland’s period. Dowland, the melancholic poet of the silvery sound of the lute, is free of any instrumental limitation that might have affected his compositions. The melodic and, at the same time, contrapuntal and harmonic approach of his music is both wonderful and unique. Its expression is one of noble sadness, melancholy, and tears, but the beauty is genuine and always caught my attention and appealed to my heart. In this, his music is somewhat similar to Franz Schubert’s. Dowland’s solo works for the lute or his songs always provided me (as did Schubert) with a restful haven in the midst of my own emotions, which allowed me to assimilate and understand his music on a more emotional level. Besides, Dowland actually composed for the lute. Of course, the lute was the primary solo instrument of his time, and the sound of Dowland’s music is a journey through time that, to this very day, speaks to our emotions. The words “lute” and “oud” derive from Arabic al-‘ud (literally means “the wood”). ‘ud may in turn be an Arabized version of the Persian rud, which meant “string”, “stringed instrument”, or “lute”. The modern guitar was preceded by the lute, the vihuela, the four-course Renaissance guitar, and the five-course baroque guitar, all of which contributed to the development of the modern six-string instrument. Though the guitar is a different instrument, it can nonetheless be faithful to the original sound of the lute and create music of the same emotional intensity. I have always found it utterly natural to transcribe Dowland’s solo works for the golden sound of the guitar, and it has been a joy to include them in many of my recitals. For some of these pieces I have added some diminutions—a diminution being the compositional device whereby a melody, theme, or motif is presented in shorter note-values than were originally used. I think that Dowland’s music should not be limited to a specific instrument, because his music is able to open up a new dimension and achieve a level of inspiration that can be shared with others. The search for Dowland’s musical soul cannot only be perceived in the lament of pieces such as Midnight and Lachrimae, etc. ; in fact, with all its shadows and lights, his music transforms itself into something created of beauty and love. Le compositeur anglo/irlandais, John Dowland, a joué un rôle majeur dans ma vie de musician et de guitariste. Il m’a inspiré dès mon plus jeune âge, lorsque que je vivais encore en Suisse, loin de l’Angleterre et de l’époque de la grande musique de Dowland. Ce poète mélancolique au son argenté du luth, est libre de toute limitation instrumentale pouvant affecter ses compositions. L’approche mélancolique de sa musique, à la fois harmonique et contrapuntique, est unique et merveilleuse. Elle évoque la tristesse noble, la mélancolie et les larmes, mais l’authenticité de sa beauté m’a toujours sensibilisé et touché au coeur. En cela, sa musique est un peu similaire à celle de Franz Schubert. Ses pièces pour luth seul et ses chants ont toujours été (comme l’oeuvre de Schubert) le refuge apaisant de mes émotions, me permettant d’assimiler et de comprendre sa musique à un niveau plus affectif. Dowland a composé sa musique spécifiquement pour le luth. C’était à l’époque l’instrument solo le plus usité et le son de la musique de Dowland est un périple dans le temps qui, aujourd’hui encore, touche nos émotions. Les mots «luth» et «oud» viennent de l’arabe al-‘ud (‘ud—littéralement «le bois»). ud pourrait être une version arabisée du perse rud, une «corde», un «instrument à cordes», ou un «luth». La guitare moderne est un ancêtre du luth, de la vihuela, guitare Renaissance à quatre choeurs, et de la guitare baroque à cinq choeurs, ayant toutes contribué au développement de l’instrument moderne à six cordes. Bien que la guitare soit un instrument différent, elle peut néanmoins reproduire le son d’origine du luth et créer une musique contenant la même intensité émotionnelle. Il m’a toujours paru très naturel d’adapter les oeuvres pour solo de Dowland aux sons riches de la guitare, et c’est avec un immense plaisir que je les inclus très souvent dans mes récitals. Dans certains morceaux, j’ai inséré des diminutions—une diminution étant un élément de composition permettant d’introduire une mélodie, un thème ou un motif dont les valeurs de notes sont plus courtes qu’à l’origine. La musique de Dowland ne devrait, à mon avis, pas être limitée à un instrument spécifique car elle est ouverte à une autre dimension et peut atteindre un niveau d’inspiration tout à fait adapté aux autres instruments. La recherche de l’âme musicale de Dowland ne peut pas être saisie seulement dans les lamentations contenues dans des oeuvres telles que Midnight et Lachrimae, entre autres; sa musique, riche d’ombre et de lumière, se transforme en une entité conçue dans la beauté et l’amour. John Dowland, der englisch-irische Komponist, hat in meinem Leben als Musiker und Gitarrist immer eine wichtige Rolle gespielt. Er inspirierte mich schon in jungen Jahren, als ich noch in der Schweiz lebte, weit weg von England und seiner grossartigen Musik aus Dowlands Zeit. Dowland, der melancholische Poet des silbernen Lautenklangs, ist frei von jeglicher instrumentalen Einschränkung, die seine Kompositionen hätte beeinflussen können. Seine melodische und zugleich kontrapunktische und harmonische Musik ist ebenso wundervoll wie einzigartig. Sie ist geprägt von edler Trauer, Melancholie und Tränen, doch auch voller Schönheit und hat mich schon immer fasziniert und emotional berührt. Darin ist sie Franz Schuberts Musik vergleichbar. Dowlands Solowerke für Laute und seine Lieder boten mir (wie Schuberts Musik) schon immer eine Oase der Ruhe, die mir erlaubte, seine Musik auch emotional aufzunehmen und zu verstehen. Zudem komponierte Dowland ja spezifisch für die Laute. Die Laute war eines der wichtigsten Instrumente seiner Zeit, und der Klang von Dowlands Musik gleicht einer Zeitreise, die uns auch heute noch berührt. Die Wörter „Laute” und „oud” stammen vom arabischen al-‘ud (wörtlich „das Holz”), während ‘ud wahrscheinlich wiederum eine arabisierte Version des persischen rud ist und „Saite”, „Saiteninstrument”, oder „Laute” bedeutet. Der modernen Gitarre gingen die Laute, die Vihuela, die vierchörige Renaissance-Gitarre und die fünfchörige Barock-Gitarre voraus, die alle zur Entwicklung des modernen sechschörigen Instruments beitrugen. Und obwohl die Gitarre ein ganz anderes Instrument ist, so kann sie doch dem ursprünglichen Klang der Laute treu bleiben und ebenso Musik von grosser emotionaler Intensität entstehen lassen. Ich fand es immer ganz selbstverständlich, Dowlands Solowerke für den goldenen Klang der Gitarre zu transkribieren und habe sie gerne in viele meiner Rezitale eingebaut. Einigen dieser Stücke habe ich Diminutionen hinzugefügt—das kompositorische Mittel, das eine Melodie, ein Thema oder Motiv durch kürzere Notenwerte als die ursprünglich verwendeten darzustellen vermag. Ich denke, Dowlands Musik sollte nicht auf ein bestimmtes Instrument beschränkt werden, weil seine Musik uns eine neue Dimension eröffnet und auch für andere eine Inspiration sein kann. Die Suche nach Dowlands musikalischer Seele ist nicht bloss in Stücken wie Midnight und Lachrimae, etc. wahrnehmbar; seine Musik, mit all ihren dunklen und lichten Momenten, verwandelt sich recht eigentlich in etwas aus Schönheit und Liebevollem Erschaffenes.